Hutcherson L. My NCBI Curriculum Vitae Web Application: SciENcv. NLM Tech Bull. 2013 Sep-Oct;(394):e3. SciENcv is a new feature in My NCBI that helps users create an online professional profile that can be made public to share with others. In SciENcv users can document their education, employment, research activities, publications, honors, research grants, and other professional contributions. In addition, the SciENcv profile may include an ORCID® iD, when registered with ORCID. eRA Commons account holders who have linked their eRA account to My NCBI will find their SciENcv profile automatically populated with the information stored in their eRA Commons profile. The information transferred from eRA Commons to SciENcv profiles can be changed, hidden, augmented, or deleted. The SciENcv Web application is the end product of a request made by the Federal Demonstration Partnership (FDP) to reduce the administrative burden associated with federal grant submissions. It is being developed under the aegis of an interagency workgroup composed of members from the Department of Defense, the Department of Energy, the Environmental Protection Agency, the National Institutes of Health, the National Science Foundation, The Smithsonian, and the United States Department of Agriculture. For additional details on the mission and guiding principles of the Science Experts Network Curriculum Vitae project, please see the project page. Figure 1: SciENcv portlet in the My NCBI homepage. Users who do not have SciENcv populated with information from another data source will be prompted to add personal information (see Figure 2). 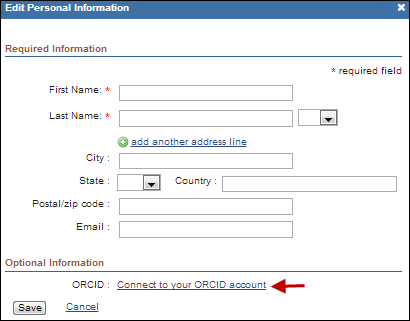 The Personal Information window has an option to connect to ORCID to link to an ORCID iD or to register for an ORCID iD. Figure 2: SciENcv Personal Information window. Only Name and ORCID iD are displayed on the profile, no other personal information will appear (see Figure 3). Figure 3: Name and ORCID iD in SciENcv. Users add their academic background and training using the SciENcv input windows. Each selection provides a different set of choices (see Figure 4). Figure 4: SciENcv Education and Training windows. Delete and edit entries by hovering over the selected academic degree/training and clicking "Delete" or "Edit" (A in Figure 5). Figure 5: Delete/edit entries in Education section of SciENcv. The "Show/hide entries" function (see B in Figure 5) allows users to select the content they want to display to viewers of their SciENcv profile. Unchecking or checking the checkbox next to an entry hides or displays the entry (see Figure 6). Figure 6: Show/hide entries in Education and Training section of SciENcv. 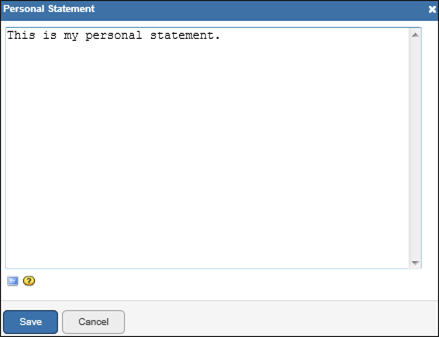 In the Personal Statement section of SciENcv users can enter a brief personal statement using a simple text window (see Figure 7). SciENcv uses markdown syntax, which allows for simple formatting to be added to the text. Formatting guidelines are provided by clicking the icon. Figure 7: Personal Statement simple text window in SciENcv. This section of SciENcvconsists of three parts: Employment, Other Experience and Professional Memberships, and Honors. Each part has a separate input window. For employment history, see Figure 8. Figure 8: Employment window of SciENcv. For other experience and professional memberships, see Figure 9. Figure 9: Other Experience and Professional Membership window in SciENcv. For honor society memberships, honorary titles and other honorary awards, see Figure 10. Figure 10: Honors window in SciENcv. Delete and edit entries in this section also by hovering over the selected work experience, professional membership, or honor and clicking "Delete" or "Edit" (see A in Figure 11). Figure 11: Delete/edit entries in Employment section of SciENcv. The "Show/hide entries" function is also available in this section (see B in Figure 11). The Selected Peer-reviewed Publications section uses My Bibliography to manage citation data in SciENcv. SciENcv profiles are automatically populated with citations stored in My Bibliography. New citations are also added to SciENcv through My Bibliography. Users who find that their My Bibliography collection is too extensive for their SciENcv profile have the option to selectively hide citations using the "Show/hide entries" function. By being unchecked, the citation shown in gray below is hidden and consequently it will not be displayed when a SciENcv profile is shared or printed (see Figure 12). Figure 12: Show/hide entries in Selected Peer-reviewed Publications section of SciENcv. The Research Support section displays a collection of ongoing and completed research awards. NIH and HRA grantees who have linked their eRA/HRA accounts to My NCBI will have their SciENcv profile automatically populated with their NIH/HRA research awards. 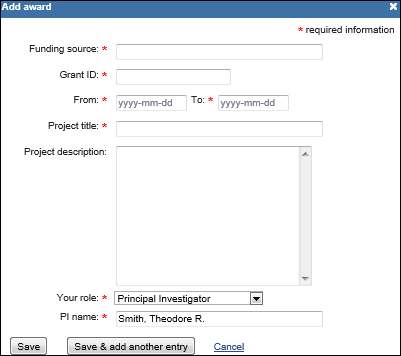 Users who have research awards issued by other agencies or institutions can add their research awards using the add award input window (see Figure 13). Figure 13: Add award window in SciENcv. In Research Support, as in other SciENcv sections, users can also selectively hide entries they wish to omit from displaying in their profile. "Edit Awards" allows users to uncheck/check the awards they want to hide or display. Awards are displayed in three tabs: NIH, HRA, and User. The first two tabs appear only when award data are transferred from eRA and HRA. 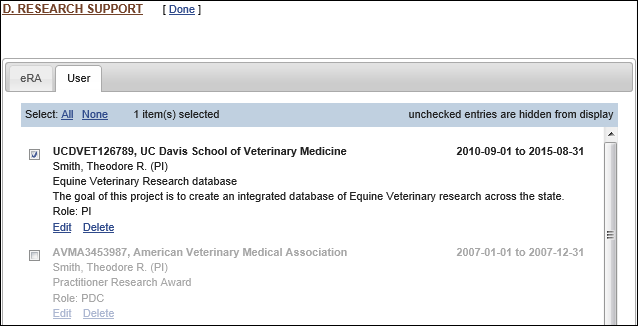 The User tab stores manually added research awards (see Figure 14). Figure 14: Edit Awards displays awards from two sources eRA and User. The research award shown in gray above is hidden and consequently it will not be displayed when a SciENcv profile is shared or printed. SciENcv profiles are set as private by default. However, a profile can be shared with others through a public URL (see A in Figure 15). Figure 15: Activate public URL and printing in SciENcv. SciENcv profiles can be printed in PDF format (see B in Figure 15). The SciENcv PDF follows the NIH Biographical Sketch format. Only the items checked for display in a SciENcv profile will be shown through the public URL or printed in the PDF. 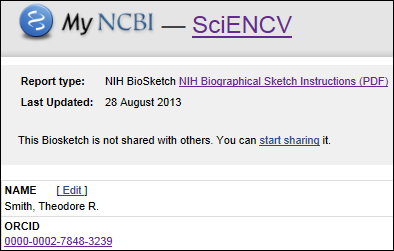 A link to Help is located in the top right corner of the NCBI SciENcv profile page.